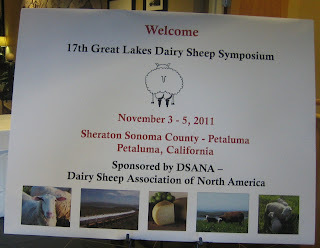 This past weekend I had the opportunity to attend the 17th Annual Dairy Sheep Symposium. For the first time ever the Symposium was held on the West Coast, in Petaluma, California (lucky us!) There were easily over a hundred people at the conference and plenty who couldn't make the trip…it is surprising to see how many people are interested in this sheep milking/cheese making niche! 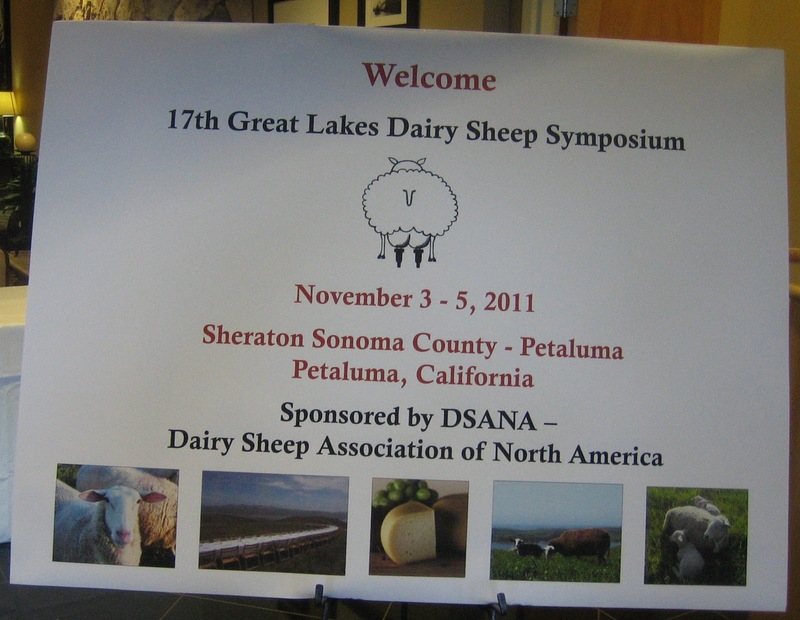 There were two days of conference-like activity, with various speakers and discussions ranging from mobile milking parlors, to artificial insemination of dairy sheep, to cheese making and marketing information, to results of scientific research projects related to dairy sheep. Included was a cheese tasting, where many attendees brought their wares to sample, as well as a banquet featuring local lamb. An ewe being inseminated in the "cradle of love"
The symposium also included a day of touring three local sheep dairies; Marin and Sonoma counties have a “Cheese Trail” and the largest (growing) concentration of artisan cheese makers in California. We first visitedBellwether Farm and Artisan Creamery, which produces several sheep milk cheeses, sheep milk yogurt and cow’s milk cheese. Bellwether's milking parlor - this is where milk comes from! We then stopped by Haverton Hill, where they have high tech electronic ear tags for all the sheep that sync to electronic milking equipment; all the milking stats for each sheep is sent directly to a computer for ease of tracking and decision making. The last farm we visited was Weirauch Creamery, one of the newest in the area. The owners have converted an old portable classroom into their creamery and are in the process of converting another into their milking parlor. To be honest, the more I heard and saw at this symposium, the more overwhelmed I felt. Sheep dairying and cheese making is far from an easy or cheap profession to get into. It seems to me that there are three way’s a person gets into it – by inheriting a working dairy, by having a large amount of off farm income to dump into starting a dairy, or - for those with neither of those options - by going into substantial debt to follow an internal passion. Everywhere I look, small farmers face massive challenges to start and sustain their farms. I wonder why is farming on a small scale is so unrealistic? Perhaps we are not placing enough value on what we eat. Agriculture should be what sustains our communities and creates health for us and our environment. Small, local farms are an incredibly important piece of our "green" future and deserve our support. Callie, I don't know about California but here in Nebraska the large scale farmer gets subsidies to grow cheap food where as the small scale farms do not. With the way the large corporations are producing cheap food with a stacked deck against the small farmer, it's very difficult to compete with them in this tight economy. The answer to the sheep dairy startup is that it can't be done without lots of money. Most of the farms here in Nebraska have been inherited from father to son or sons for at least three generations. This is the first generation that doesn't want to take over the family farm so the big corporations come in a buy up the land and pay someone to farm it. The first generation of starting any business requires lots of hard work, not much profit, and some one in the next generation to take it to the next level when they inherit it. For a business like sheep dairy and cheese making, it would be very difficult to make a lot of money in the first generation. Most businesses start small with supplemented income outside of the business and work their way up to big over many years. There's always the exception and there a few that climb the ladder to success faster than the norm. You have the skills, desire, and are trying to get the education. Those are all steps in the right direction. Who knows maybe some day I'll be eating a slice of sheep cheese with your farm's logo on it. :0) Happy Thanksgiving to you and every one in your realm of influence.